Cane Miro (character from Gunslinger): The good die first. Tom Servo: Most people are morally ambiguous, which explains our random dying patterns. Everybody has seen a movie that is so awful it inevitably forces the question: What good could ever have possibly come from wasting time and money on this garbage? Well, for many years, the answer was practically nothing. But a mild-mannered Minnesota lad, Joel Hodgson, found a way to help redeem the idiotic decision-making that wasted countless miles of celluloid. He started a low-budget TV show that aired on Minnesota's public access channel, and who would have thought that his silly idea would become such a cult hit. The TV show is Mystery Science Theater 3000, which is set in the not too distant future. The evil Dr. Clayton Forester (Trace Beaulieu) punishes Joel Robinson (played by Joel Hodgson himself) by making him watch old, crappy B-movies on the moon. In order to make the torture less painful, Joel creates two robot friends, Crow T. Robot (voiced by Beaulieu) and Tom Servo (voiced by Kevin Murphy). The three of them get to do what all movie-goers have wanted to do at one time or another: voice their dissent and disgust at the crap being projected on the silver screen. 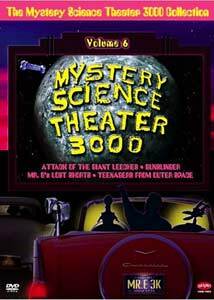 The Mystery Science Theater 3000: Volume 6 features four episodes, spread over four discs that offer a variety of opportunities for the cast to make snide remarks. Disc 1 features Attack of the Giant Leeches, a 1959 horror movie from executive producer Roger Corman. The horrible leech costumes are funny enough on their own, but without Joel, Crow, and Servo, it would be an arduous task to sit through this movie. The best jokes in this episode revolve around the shop owner, Dave (Bruno VeSota), and his disproportionately hot wife, Liz (Yvette Walker). This first disc also has a bonus short, Undersea Kingdom, about the people of Atlantis waging war with the U.S. Navy. Film buffs will enjoy the comments made during this sequence, with tons of references to classics like Citizen Kane, They Shot Horses, Don't They?, and Apocalypse Now among others. This episode is not one of the best examples of the comic styling of the program, but it offers plenty of laughs. The second disc takes aim at the Roger Corman-directed Gunslinger, starring Beverly Garland and John Ireland. Ireland was a respected, Oscar-nominated actor when this was made in 1956, so one has to wonder how he got caught up in this project. More than any of the other episodes provided for this DVD, this one shows that the strength of the show comes from the two robots. Crow and Servo do a marvelous job of slipping in dialogue so effortless, you just have to know that the writers and actors worked damn hard to pull this off. One of the funniest lines ever uttered on the show comes near the end of the movie, where Crow states, "This is just like Ride the High Country, only not good." The problems with this episode are the skits by the cast. When the Sci-Fi Channel picked up the show, the network's executives wanted to have each show contain its own story arc apart from the movie. The reason why this show is funny isn't because it's a variety hour, but because it decimates the horrible acting, writing, and directing of terrible movies. Disc 3 is devoted to six shorts, pitching a variety of ideas and products. The most amusing to watch of the bunch is Design for Dreaming, a GM Motorama musical vision of the future. Thankfully, the products and fashions shown here never came to bear, but, as Servo points out, while GM was making this short, the Japanese were designing superior cars. Some of the jokes here are topical, such as those about the recession under George H.W. Bush, and thus feel dated. There's also an element to the education films, like Are You Ready for Marriage?, that is so campy that it might actually be better to watch them without the cast's comments. The final episode provided here is a rip at Teenagers from Outer Space. This is a highlight from the series, where they take aim at the old Communists-disguised-as-space-aliens sci-fi movies. Here, a crew lands on Earth to unleash a horrible monster (the special effects are a far cry from today's, since it is nothing more than a lobster's shadow projected onto the image). Joel, Crow, and Servo eat up this story, making tons of Star Trek jokes about the aliens' costumes and the cheesy skeleton effects. Again, the trio makes plenty of inside jokes for film buffs, but also add hilarious dialogue during gaps of silence that turn this into an irresistible piece of camp. It looks as though Mystery Science Theater 3000 is never going to receive a completely decked-out DVD release, but these four episodes provide plenty of laughs. Anybody who has ever wanted to lash out at the cheap garbage being pumped out into theaters now has an opportunity to live vicariously through the comic timings of the MST3K series on DVD. Image Transfer Review: If the these old movies were to be cleaned up, it would take away a lot of the fun of launching insults at them. The features viewed by Joel, Crow, and Servo look fittingly beaten up, while the character and theater seat silhouettes are solid black. The scenes set in the space station are slightly soft, but it adds to the feel of this being a low-budget, public access TV show. Audio Transfer Review: The mono English audio also presents the movies in all their lackluster glory. It would be nice if the scenes on the space station were cleaned up a bit, since at times the sound effects are fairly muffled (though this is an accurate presentation of how the show originally aired). Dialogue is crisp, with the cast's comments being well balanced alongside the dialogue and sound of the movies. Extras Review: There are no supplemental features on this set, just full motion menus with sound. Rhino delivers four enjoyable outings of Mystery Science Theater 3000 in this sixth installment of their series. Some of the skits fall flat, but the witty comments during the movies make up for that. The image is rightly crummy and anything other than a mono sound mix would distract from the horrible production values of these terrible "classics." The only downside to this release is a lack of extras.